The Acropolis of Athens (1846) is a painting by Leo von Klenze of the Acropolis of Athens. It is an idealized reconstruction of the Acropolis and Areopagus in Athens. Neoclassicism (from Greek "neos"-νέος, Latin "classicus" and Greek "ismos"-ισμός) is the name given to Western movements in the decorative and visual arts, literature, theatre, music, and architecture that draw inspiration from the "classical" art and culture of Ancient Greece or Ancient Rome. The main Neoclassical movement coincided with the 18th century Age of Enlightenment, and continued into the early 19th century, latterly competing with Romanticism. In architecture the style continued throughout the 19th and 20th centuries and into the 21st. The terms neoclassical and neoclassicism were coined in the 1870s and 1890s respectively. 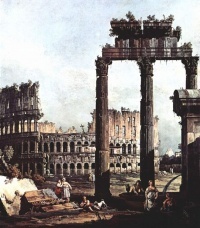 The development of neoclassicism was influenced by the 18th century excavations of Pompeii, Herculaneum, and Stabiae and the cliques around German art historian Winckelmann and amateur club the Society of Dilettanti. Two publications proved to be particularly influential, History of Ancient Art (1764) by the aforementioned Winckelmann and Le Antichità di Ercolano, a series of books from the 1750s onwards. 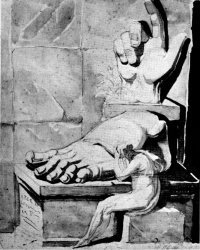 Important exponents of neoclassicism were in sculpture Antonio Canova; in painting Jacques-Louis David, Anton Raphael Mengs, Angelica Kauffmann, Bertel Thorvaldsen, and Joseph-Marie Vien; in architecture Giovanni Battista Piranesi, Claude Nicolas Ledoux and John Soane. The first Neoclassical painting is generally held to be The Oath of the Horatii by J. L. David. What any "neo"-classicism depends on most fundamentally is a consensus about a body of work that has achieved canonic status. These are the "classics." Ideally— and neoclassicism is essentially an art of an ideal— an artist, well-schooled and comfortably familiar with the canon, does not repeat it in lifeless reproductions, but synthesizes the tradition anew in each work. This sets a high standard, clearly; but though a neoclassical artist who fails to achieve it may create works that are inane, vacuous or even mediocre, gaffes of taste and failures of craftsmanship are not commonly neoclassical failings. Novelty, improvisation, self-expression, and blinding inspiration are not neoclassical virtues; neoclassicism exhibits perfect control of an idiom. It does not recreate art forms from the ground up with each new project, as modernism demanded. "Make it new" was the modernist credo of the poet Ezra Pound. Speaking and thinking in English, "neoclassicism" in each art implies a particular canon of "classic" models. Virgil, Raphael, Nicolas Poussin, Haydn. Other cultures have other canons of classics, however, and a recurring strain of neoclassicism appears to be a natural expression of a culture at a certain moment in its career, a culture that is highly self-aware, that is also confident of its own high mainstream tradition, but at the same time feels the need to regain something that has slipped away: Apollonius of Rhodes is a neoclassic writer; Ming ceramics pay homage to Sung celadon porcelains; Italian 15th century humanists learn to write a "Roman" hand we call italic (a.k.a. Carolingian); Neo-Babylonian culture is a neoclassical revival, and in Persia the "classic" religion of Zoroaster, Zoroastrianism, is revived after centuries, to "re-Persianize" a culture that had fallen away from its own classic Achaemenean past. Within the direct Western tradition, the earliest movement motivated by a neoclassicial inspiration is a Roman style that was first distinguished by the German art historian Friedrich Hauser (Die Neuattische Reliefs Stuttgart 1889), who identified the style-category he called "Neo-Attic" among sculpture produced in later Hellenistic circles during the last century or so BCE and in Imperial Rome; the corpus that Hauser called "Neo-Attic" consists of bas reliefs molded on decorative vessels and plaques, employing a figural and drapery style that looked for its canon of "classic" models to late 5th and early 4th century Athens and Attica. In the visual arts the European movement called "neoclassicism" began after ca 1765, as a reaction against both the surviving Baroque and Rococo styles, and as a desire to return to the perceived "purity" of the arts of Rome, the more vague perception ("ideal") of Ancient Greek arts (where almost no western artist had actually been) and, to a lesser extent, 16th century Renaissance Classicism. Contrasting with the Baroque and the Rococo, Neo-classical paintings are devoid of pastel colors and haziness; instead, they have sharp colors with Chiaroscuro. In the case of Neo-classicism in France, a prime example is Jacques Louis David whose paintings often use Greek elements to extol the French Revolution's virtues (state before family). Each "neo"- classicism selects some models among the range of possible classics that are available to it, and ignores others. The neoclassical writers and talkers, patrons and collectors, artists and sculptors of 1765 - 1830 paid homage to an idea of the generation of Pheidias, but the sculpture examples they actually embraced were more likely to be Roman copies of Hellenistic sculptures. They ignored both Archaic Greek art and the works of Late Antiquity. The Rococo art of ancient Palmyra came as a revelation, through engravings in Wood's The Ruins of Palmyra. Even in all-but-unvisited Greece, a rough backwater of the Ottoman Empire, dangerous to explore, neoclassicists' appreciation of Greek architecture was mediated through drawings and engravings, which subtly smoothed and regularized, "corrected' and "restored" the monuments of Greece, not always consciously. As for painting, Greek painting was utterly lost: neoclassicist painters imaginatively revived it, partly through bas-relief friezes, mosaics, and pottery painting and partly through the examples of painting and decoration of the High Renaissance of Raphael's generation, frescos in Nero's Domus Aurea, Pompeii and Herculaneum and through renewed admiration of Nicholas Poussin. Much "neoclassical" painting is more classicisizing in subject matter than in anything else. There is an anti-Rococo strain that can be detected in some European architecture of the earlier 18th century, most vividly represented in the Palladian architecture of Georgian Britain and Ireland, but also recognizable in a classicizing vein of architecture in Berlin. It is a robust architecture of self-restraint, academically selective now of "the best" Roman models. Neoclassicism first gained influence in England and France, through a generation of French art students trained in Rome and influenced by the writings of Johann Joachim Winckelmann, and it was quickly adopted by progressive circles in Sweden. At first, classicizing decor was grafted onto familiar European forms, as in the interiors for Catherine II's lover Count Orlov, designed by an Italian architect with a team of Italian stuccadori: only the isolated oval medallions like cameos and the bas-relief overdoors hint of neoclassicism; the furnishings are fully Italian Rococo (illustration, left). But a second neoclassic wave, more severe, more studied (through the medium of engravings) and more consciously archaeological, is associated with the height of the Napoleonic Empire. In France, the first phase of neoclassicism is expressed in the "Louis XVI style", the second phase in the styles we call "Directoire" or Empire. Italy clung to Rococo until the Napoleonic regimes brought the new archaeological classicism, which was embraced as a political statement by young, progressive, urban Italians with republican leanings. The high tide of neoclassicism in painting is exemplified in early paintings by Jacques-Louis David (illustration, left) and Jean Auguste Dominique Ingres' entire career. David's Oath of the Horatii was painted in Rome and made a splash at the Paris Salon of 1784. Its central perspective is perpendicular to the picture plane, made more emphatic by the dim arcade behind, against which the heroic figures are disposed as in a frieze, with a hint of the artificial lighting and staging of opera, and the classical coloring of Nicholas Poussin. In sculpture, the most familiar representatives are the Italian Antonio Canova, the Englishman John Flaxman and the Dane Bertel Thorvaldsen. The European neoclassical manner also took hold in the United States, where its prominence peaked somewhat later and is exemplified in the sculptures of William Henry Rinehart (1825-1874). In the decorative arts, neoclassicism is exemplified in Empire furniture made in Paris, London, New York, Berlin; in Biedermeier furniture made in Austria; in Karl Friedrich Schinkel's museums in Berlin, Sir John Soane's Bank of England in London and the newly built "capitol" in Washington, DC; and in Wedgwood's bas reliefs and "black basaltes" vases. The Scots architect Charles Cameron created palatial Italianate interiors for the German-born Catherine II the Great in Russian St. Petersburg: the style was international. Indoors, neoclassicism made a discovery of the genuine classic interior, inspired by the rediscoveries at Pompeii and Herculaneum, which had started in the late 1740s, but only achieved a wide audience in the 1760s, with the first luxurious volumes of tightly controlled distribution of Le Antichità di Ercolano. The antiquities of Herculaneum showed that even the most classicizing interiors of the Baroque, or the most "Roman" rooms of William Kent were based on basilica and temple exterior architecture, turned outside in: pedimented window frames turned into gilded mirrors, fireplaces topped with temple fronts, now all looking quite bombastic and absurd. The new interiors sought to recreate an authentically Roman and genuinely interior vocabulary, employing flatter, lighter motifs, sculpted in low frieze-like relief or painted in monotones en camaïeu ("like cameos"), isolated medallions or vases or busts or bucrania or other motifs, suspended on swags of laurel or ribbon, with slender arabesques against backgrounds, perhaps, of "Pompeiian red" or pale tints, or stone colors. The style in France was initially a Parisian style, the Goût grec, not a court style. Only when the plump, young king acceded to the throne in 1774 did his fashion-loving Queen bring the "Louis XVI" style to court. From about 1800 a fresh influx of Greek architectural examples, seen through the medium of etchings and engravings, gave a new impetus to neoclassicism that is called the Greek Revival. Neoclassicism continued to be a major force in academic art through the 19th century and beyond—a constant antithesis to Romanticism or Gothic revivals— although from the late 19th century on it had often been considered anti-modern, or even reactionary, in influential critical circles. By the mid-19th century, several European cities—notably St Petersburg and Munich—were transformed into veritable museums of Neoclassical architecture. In American architecture, neoclassicism was one expression of the American Renaissance movement, ca 1890-1917; its last manifestation was in Beaux-Arts architecture, and its very last, large public projects were the Lincoln Memorial (highly criticized at the time), The National Gallery in Washington, DC (also heavily criticized by the architectural community as being backward thinking and old fashioned in its design), and the American Museum of Natural History's Roosevelt Memorial. These were white elephants when they were built. In the British Raj, Sir Edwin Lutyens' monumental city planning for New Delhi marks the glorious sunset of neoclassicism. World War II was to shatter most longing for - and imitation of - mythical, heroic times. Meanwhile, conservative modernist architects like Charles Perret in France kept the rhythms and spacing of columnar architecture even in factory buildings. Where a colonnade would have been decried as "reactionary," a building's pilaster-like fluted panels under a repeating frieze looked "progressive." Pablo Picasso experimented with classicizing motifs in the years immediately following World War I, and the Art Deco style that peaked in the 1925 Paris Exposition des Arts Décoratifs often drew on neoclassical motifs without expressing them overtly: severe, blocky commodes by E. J. Ruhlmann or Sue et Mare; crisp, extremely low-relief friezes of damsels and gazelles in every medium; fashionable dresses that were draped or cut on the bias to recreate Grecian lines; the art dance of Isadora Duncan; the Streamline Moderne styling of US post offices and county court buildings built as late as 1950; and the Roosevelt dime. Neoclassic themes can even be detected in the Smith Tower, Seattle. There was an entire 20th century movement in the Arts which was also called Neo-classicism. It encompassed at least music, philosophy, and literature. It was between the end of World War I and the end of World War II. For information on the musical aspects, see 20th century classical music#Neoclassicism and Neoclassicism (music). For information on the philosophical aspects, see Great Books. This literary neo-classical movement rejected the extreme romanticism of (for example) dada, in favour of restraint, religion (specifically Christianity) and a reactionary political program. Although the foundations for this movement in English literature were laid by T.E. Hulme, the most famous neoclassicists were T.S. Eliot and Wyndham Lewis. In Russia, the movement crystallized as early as 1910 under the name of Acmeism, with Anna Akhmatova and Osip Mandelshtam as the leading representatives. Many buildings in neoclassical style are still built today. A good recent example is Schermerhorn Symphony Center. Unless indicated otherwise, the text in this article is either based on Wikipedia article "Neoclassicism" or another language Wikipedia page thereof used under the terms of the GNU Free Documentation License; or on original research by Jahsonic and friends. See Art and Popular Culture's copyright notice. This page was last modified 17:35, 15 November 2017. This page has been accessed 25,081 times.